*** Dec 5, 2018: The deadline for the submission is extended to December 29. Ranging from J-pop to Indonesian punk, from Chinese folk to Japanese Enka, from Bollywood songs to Thai heavy metal, music takes multiple forms and identities, allowing for complex negotiations of both time and place. These forms quickly travel, mostly regionally, and in some rare cases also globally. The circulation of sounds changes over time, for example, where in the 1990s Cantopop played an important role regionally, this role has now been taken over by both Mandapop and K-Pop. The sound of Bollywood, on the other hand, continues to fascinate the global imagination. Further down in South-east Asia, Indonesian and Malaysian boy bands merge their Islamic beliefs with the global sound of pop. Amidst this cacophony of voices, sounds and images, we wonder: what are the sounds of that construct called “Asia”? How do sounds travel regionally, and globally, and why? How comes that certain sounds travel better than others? How does the music industry respond to the changes caused by globalization and digitization? What transnational fancultures do emerge? The entanglements we witness refer not only to place but also to time, for example, folk music often expresses an urban alienation and romanticizes a forgotten past, while other sounds from the past are brought back to life, or reassembled in a quite different form, or come from a different place. The nostalgia of Japanese Enka speaks to the longings of urban youth in Taiwan. And take for example the Chinese band RETROS and their reinterpretation of the 80s sound of Bauhaus from the UK, or a reinterpretation of the Shanghai sound of Zhou Xuan from the 1930s and 1940s in electronic music. At the same time, in India, old Bollywood classics are reworked into club house dance songs. These various music cultures and their social significance cannot be possible without the workings of the music industry, whether on a local, regional or international scale. This conference aims to bring scholars together that work on the different popular musics of Asia, linking these to negotiations of both place and time, and paying special attention to the entanglements of sound with these two categories. Please submit an abstract (200-300 words) and short bio (max. 100 words) by 15 29 December 2017 to iapmsconference@gmail.com. For panels, please submit a general panel description of 200-300 words, four abstracts (200-300 words each) and biographies (max. 100 words each). Please use the Proposal Form (right click to download) when submitting your proposal, and use your surname as file name (ex. Chua.doc, Douglas.doc). A fine addition to the highly recommended series Global Popular Music (edited by Franco Fabbri and Goffredo Plastino), this volume on popular music in Korea (short for South Korea) is as comprehensive as such a book can be. Its sixteen thematic chapters are divided into four sections, devoted to histories, genres, artists, and socio-cultural issues. These are preceded by a short introduction, outlining some basic information about Korean history, aspects of language, and transcription. The book is rounded up by a chapter on the circulation of Korean pop in Asia, and (a permanent feature in the series) a conversation with a prominent musician. In this case it is the late Shin Hae-chul (1968–2014), a major figure in Korean pop-rock music of the 1990s. Admittedly, I am not an expert on Korean music or culture. 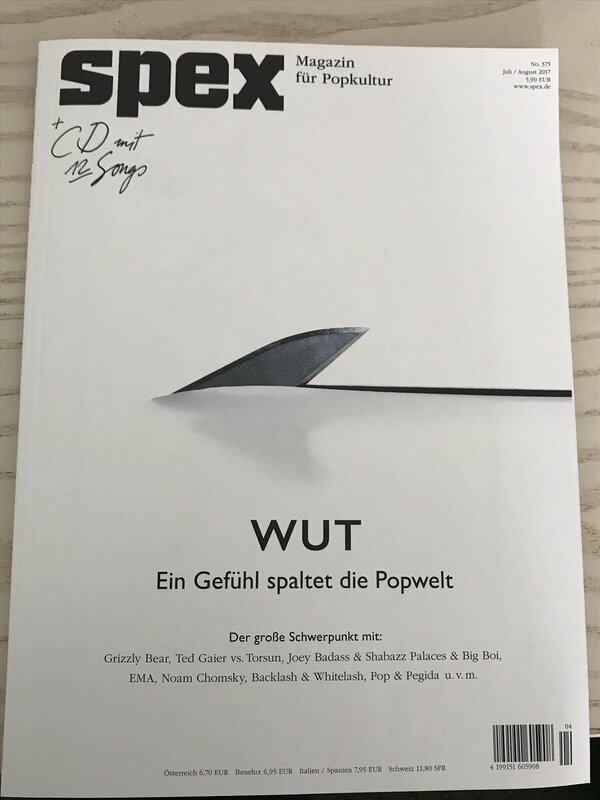 For my own work on the globalization of pop-rock music (see Regev) I have consulted several available texts in English (notably Epstein; Howard; Shin; Kim and Shin) that provided intriguing introductions to the complexity and richness of the field of pop-rock in this country. This new book goes several steps further in offering a multifaceted view of major themes and issues in Korean popular music. Three key topics seem to be at the core of any interest in Korean pop-rock. These are the stylistic and socio-cultural evolution of pop-rock music in Korea, and especially its relation to local indigenous traditions; the social and political context of pop-rock music production and consumption, amid the prominent American presence in the country or the authoritarian regimes that were in power until the 1990s; and the phenomenon of K-Pop that swept young people in East Asia and other parts of the world at the turn of the twenty-first century. Indeed, audiences in other parts of the world became aware of Korean popular music mostly in the wake of K-pop. This major phenomenon is covered here in two chapters. One (by Sun Jung) illuminates the deliberate production of the “wave” as an export project by the cultural industries of Korea, and especially their conscious use of social media. The other (by Dong-Yeun Lee) examines the meaning and role of idols in the context of K-Pop. Combining pop tunes and glamorous images of youth, these cultural products with short life spans are interpreted here as typical of the neo-liberal market. K-pop and idol culture are, however, but one relatively recent phase in the history of Korean pop-rock. As the thread that runs through this book makes clear, it is a history characterized by a quest for a balance between Western, mostly Anglo-American influences, and traditional or indigenous sounds. Strictly local genres attempt to preserve a musical language of supposedly pure “Korean-ness.” These obviously include folk music and People’s Song (both discussed here in a chapter by Aekyung Park), but also Trot and Ballad, explained and described in a chapter by Yu-Jeong Chang. Several chapters in the book add up to present a broad picture of the stylistic evolution of pop-rock in Korea, including explorations of typical Korean sounds and the intricate ways in which this has been entangled with changing attitudes of the regime towards popular music. A chapter by Jung-Yup Lee in the History section follows the change in media broadcasting of music from being a state and politically controlled institution to a highly commercialized and diverse mechanism in the 1990s and 2000s. Soojin Kim, in her chapter in the Issues section, completes this aspect by surveying the ambivalence towards popular music in the cultural policies of the regimes through the years. Chapters in the Artists section fill this institutional context with examinations of three towering figures in the history of Korean pop-rock. Dohee Kwon focuses on Shin Joong Hyun, one of the most influential and prominent rock musicians in the country, and especially on one of his most famous works, “Miin” (1974); Okon Hwang outlines the career of composer and singer Kim Min-ki, whose song “Ach’imisŭl” became an anthem for the anti-dictatorship movement of the 1970s; and Eun-Young Jung discusses the impact of Seo Taiji, whose career was pivotal in introducing hip hop, dance, metal and hard rock to the mainstream of Korean popular music. Additionally, an interesting chapter by Haekyung Um in the Issues section examines changes in the vocal style of Korean singers along history and across styles, and points to the cultural shifts reflected in them. A review of the stylistic scope and genealogy of Korean pop-rock is provided by Pil Ho Kim in the Genres section. His chapter traces the path of Korean rock from the early Group Sound phenomenon of the 1960s and early 1970s to the most recent indie and alternative bands of the 2000s. His observation about the relation of twenty-first-century indie rockers, who “managed to bring back the old formula of global-local balance with a new twist,” to the history of Korean popular music seems to capture the cultural essence of the story unfolded in this book. He writes, “For example, 3rd Line Butterfly resurrects Kim Hae-song, the jazz genius during the 1930-1940s, by sampling his music in “Kimp”o ssangna’al’ (Double Horn of Kimp’o, 2004). Chang Ki-ha Wa Ŏlgul Tŭl (Chang Kiha and the Faces) . . . makes clever references to Group Sound rock and modern folk of the 1970s.” Kim concludes that “Korean popular music has been around long enough to establish a tradition of its own and to help create new local sound that may well be added to the global repertoire of rock music” (all quotations 80). Regretfully, language and other cultural aspects hinder fans in other countries from getting acquainted with and enjoying the full range of pop-rock music from Korea. At the scholarly level, however, this book provides an expansive overview, written by an expert team of researchers. This book is certainly not just for scholars of Korean or Asian culture. I think that researchers in popular music, cultural studies, media, and cultural sociology who are interested in the details and intricacies of cultural globalization can find a wealth of information and insights hidden in these pages. Epstein, Stephen J. “Anarchy in the UK, Solidarity in the ROK: Punk Rock Comes to Korea.” Acta Koreana 3 (2000): 1–34. Print. Howard, Keith, ed. Korean Pop Music: Riding the Wave. Folkestone: Global Oriental, 2006. Print. Kim, Pil Ho, and Hyunjoon Shin. “The Birth of ‘Rok’: Cultural Imperialism, Nationalism, and the Glocalization of Rock Music in South Korea, 1964–1975.” Positions 18 (2010): 199–230. Print. Regev, Motti. Pop-Rock Music: Aesthetic Cosmopolitanism in Late Modernity. Cambridge: Polity, 2013. Print. Shin, Hyunjoon. “The Success of Hopelessness: The Evolution of Korean Indie Music.” Perfect Beat 12 (2011): 147–165. Print. 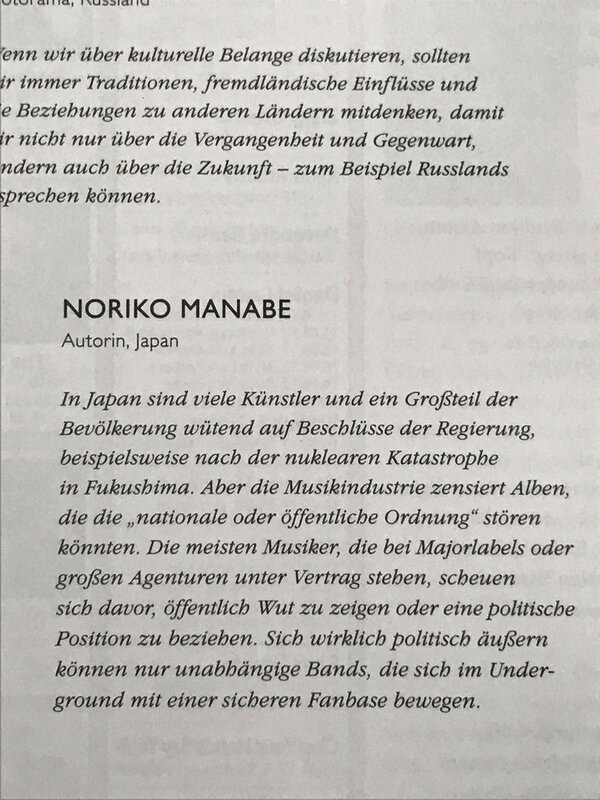 An interview with Manabe Noriko in what probably is the most challenging German music and popular culture magazine, Spex. The current issues’ topic is “anger and resistance” and the interview with Noriko is part of the cover story. Keynote Speakers: Stay tuned for the announcement of more speakers! Submit your proposal before 24:00, Nov. 30th, 2017(Beijing time). The call for both pre-organized panel and paper proposals (for both main conference and pre-conference) is now open.Submission guidelines and forms can be accessed here. Spread the news! Please share this page with your colleagues and friends – we look forward to seeing you in Shanghai in the summer of 2018!